finally a piece of uplifting news! 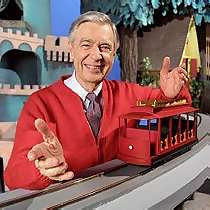 as i was browsing CNN.com i found this article on Mr. Rogers, entitled: 15 reasons Mr. Rogers was best neighbor ever. On the way back, Rogers sat up front, and when he learned that they were passing the driver's home on the way, he asked if they could stop in to meet his family. According to the driver, it was one of the best nights of his life the house supposedly lit up when Rogers arrived, and he played jazz piano and bantered with them late into the night. Further, like with the reporters, Rogers sent him notes and kept in touch with the driver for the rest of his life.